I’m not sure when I first heard the name of Louise Farrenc, nor why I decided to first listen to her symphonies. Quite possibly it was curiosity (read: procrastination) that led me to some of those “labor-of-love” YouTube channels that attempt, in similar fashion to this project, to share “undiscovered” works from the past. Admittedly, many of the pieces to be found on such channels benefit from the unfamiliarity, but there are a few gems to be mined, and the works of Louise Farrenc number among them. Although I am fond of all of the orchestral works of Louise Farrenc, and while I intend to explore each of these pieces during the course of this project, today’s entry will focus on her Symphony No. 3 in G-minor. Her final work in the form, it happens to be the first of her symphonies that I encountered, and the first one that I was able to access a score to (thanks to the miracles of Interlibrary Loan!). Just a quick note: this entry ended up being quite a bit longer than I initially planned, so I will be dividing it in two. The first post will be background information and information about the currently available recordings; the second will be the actual analysis. Make sure to come back for the next post, as that’s where the real fun begins! Rubio, Luigi. 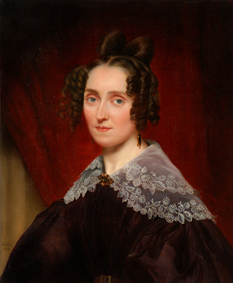 Portrait of Louise Farrenc, 1835. While essentially forgotten in the concert hall today (except, strangely, the past year—is there something in the water? ), Louise Farrenc was by no means unknown during her lifetime. Prior to her marriage to the music publisher Aristide Farrenc, she trained as a composer under Anton Reicha at the Paris Conservatoire—a pedigree she shares with both Liszt and Berlioz. It is perhaps thanks to her marriage to Aristide that she had a leg up in cracking the 19th-century glass cage around female composers; it was he who published her piano compositions, chamber music, and promoted her music at home and abroad. Of course, this is not to undermine the quality of her work and chalk up her success to mere nepotism, nor to suggest that no other publisher took interest: houses in London and Bonn both published some of her works. Robert Schumann even gave a positive review of her Air russe varié: “so sure in outline, so logical in development … that one must fall under their [the variations’] charm, especially since a subtle aroma of romanticism hovers over them" (source: Grove Dictionary Online). But what of her orchestral works? Even in the 19th century, arranging a performance of a symphonic piece was a monumental task. It appears, however, that thanks to the success of her chamber music and her husband’s efforts to promote her compositions, she was successful at gaining not just one, but multiple performances of these larger pieces. It is an unfortunately small number—two overtures and three symphonies—but according to the forward to the new Florian Noetzel Verlag edition of her works, “French instrumental music took on a peripheral position in Parisian musical life” in favor of music theater (read: Grand Opera). This has presumable led rise to the thesis posited by the Grove dictionary that, had Farrenc composed opera, she would have been far more notable; this begs the question as to whether a woman would have found it easy to do so at the time she was working. While not as renowned as her chamber music, Farrenc's orchestral works were reviewed favorably, although inevitably (the same as today) compared only to the composers on the same program (read: Beethoven). Despite the efforts of her husband to get her works known in Germany as well as France, the only other cities outside Paris that heard her orchestral compositions were Geneva and Brussels. As reported by the forward to the 3rd symphony, this lack of exposure took a toll on Farrenc and even these foreign premieres were not enough to overtake her disappointment: “such an event could not give her the strength and energy to compose…Aristide…refers to the fact that his wife in her last years, probably since the death of her daughter Victorine in January 1859, no longer composed and even very rarely appeared as a pianist” (source: forward to the new edition, translated by me). This is the unfortunate reality when we look into female composers from history, be it Fanny Mendelssohn, Clara Schumann, or Louise Farrenc. Their talents and successes pale compared to the weight of the institutional objects placed before them. While not always explicitly stated to each that “a woman should not be a composer” (although sometimes it was explicit), the expectations to be a devoted wife, servant of the husband’s art, or teacher on the compositional periphery forced each of these women to give up their work too early or without the full efforts of their male colleagues able to devote themselves fully to their craft. While we can look at many composers in “periods”—early, middle, and late Mozart, Beethoven, Schumann—for these women we only have whatever time of life they found opportunities open and a public, however dubiously, receptive. If it seems that each is sometimes an unfulfilled, not-yet-developed promise, that is because they are. We must not only evaluate them according to what society let them be; we must use our efforts to see them according to who they were, and who they could have become. Though married to a publisher, none of Louise Farrenc’s orchestral works were published during her lifetime. Numerous reasons could be postulated for this, and probably each carry a bit of truth—that French orchestral music was confined to the periphery at the time of her composing, that the orchestras that performed her pieces did not carry enough international prestige, or good-old-fashioned (sic) sexism. At some point, I will write an entry about how publishing-houses have proven an extraordinarily steep institutional barrier to the study and spread of music by underrepresented composers. Even going out of my way in 2018 to try to find and access these scores, my efforts have been frustrated and challenged. In this case, despite the piece’s age, the only available published score of this work is the new Florian Noetzel Verlag Critical Edition. It is a beautiful score: well-researched, well-edited, and exactly the sort of presentation her music needs to succeed a revival. The cost of the score, however, reflects this, and the modern scholarship takes this particular publication of the piece back out of the public domain. Therefore, as I mentioned earlier, Interlibrary Loan has proven invaluable at being able to view this work and others like it. This symphony is Louise Farrenc’s last completed orchestral work, finished in 1847 and premiered in 1849 by the Société des concerts du Conservatoire. It was performed again in 1850 in Geneva and 1853 in Paris, both times by the orchestra her husband founded, the Societe symphonique. 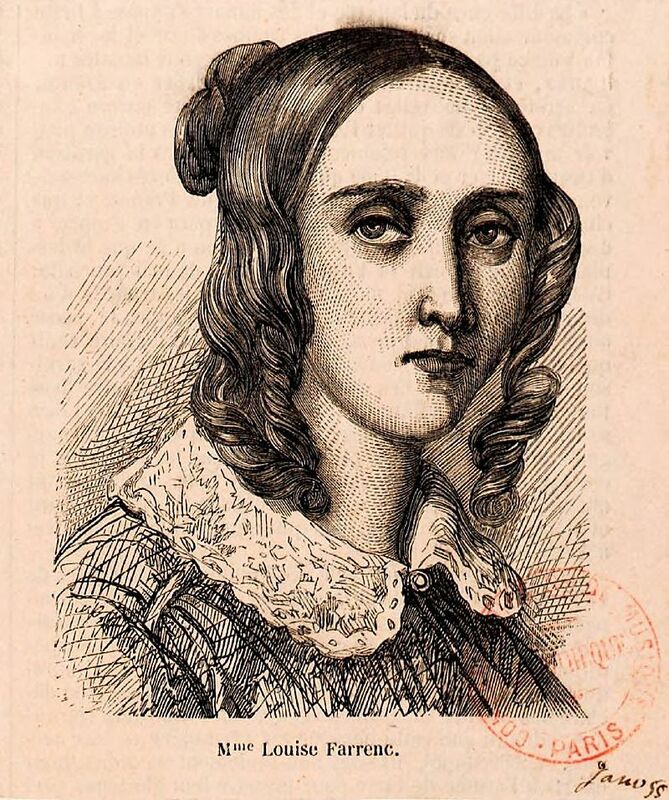 A final performance during the composer’s lifetime happened at the Brussels Conservatory in 1863, led by the director of the institution and a champion of Farrenc’s music (see the preface to the new edition to get the complete rundown of her career at this time). It is, as was observed at the time of the premiere (and has been observed every performance since! ), a symphony in the lineage of Beethoven. This is no criticism; the same could easily be said of Felix Mendelssohn and Robert Schumann (for reference, Mendelssohn’s final “Scottish” symphony was premiered in 1842; Schumann’s third and revised fourth symphonies appeared in 1851). The only “canonical” composer who was truly revolutionizing the form in the mid-1800s was Berlioz, and we’re still coming to terms with the particular strain of madness that gave rise to 1830’s Symphonie fantastique. Cast in four movements, Farrenc’s Third follows the traditional arrangement: sonata, aria, scherzo/trio, and finale. We’ll get to analyzing them each in the next entry; suffice to say the majority of Farrenc’s invention is on a local, rather than structural level. A number of performances of this work have popped up in recent years, but as of today only two professional recordings are available commercially. The first is by Johannes Goritzki and the NDR Radio Philharmonic, where Farrenc’s Third is paired with her Symphony no. 1 (a companion CD is also available, pairing her second symphony with her two overtures). The second is a brand new release from Christoph König and the Solistes Européen, Luxembourg, where her second and third symphonies appear together. In addition to these CD releases, there is a recent video broadcast by Mikko Franck and l’Orchestre Philharmonique de Radio France with excellent sound and performance quality. There is at least one other performance on YouTube, but as it is not by a professional group I will not be discussing it. Of these three professional recordings, each has some distinct value to offer our study and understanding of the piece. The earlier NDR recording plays the piece with enthusiasm and careful attention to detail, giving an exciting and engaging reading. The more recent Solistes Européen, Luxembourg recording has better sound quality, but somehow comes across as lacking the dramatic weight even such a classically-styled symphony deserves. I believe l’Orchestra Philharmonique de Radio France does the best job across the board (you can watch/listen at the top of this page). The approach is elegant, the musicianship excellent, and the tempi seem appropriate. While I do not agree with every decision made during the performance, I usually end up feeling that way about any recording after I've studied a piece. At the very minimum, the choices are well within the realm of accurate and appropriate interpretation. Louise Farrenc's signature as printed on the cover of the Florian Noetzel Verlag edition of each of her symphonies. As mentioned at the start of this article, you'll see the actual analysis of the work arrive in the next post, as it ended up being an entry all to itself. In the meantime, I would encourage you to listen to the work a few times, and then come back ready to look at what's actually going on beneath the surface. Farrenc, Louise; ed. Heitmann. Symphony No. 3 g-Moll op. 36. Florian Noetzel Verlag, Wilhelmshaven, 1998. Friedland, Bea. "Farrenc family." Grove Music Online. 13 Apr. 2018. http://www.oxfordmusiconline.com/grovemusic/view/10.1093/gmo/9781561592630.001.0001/omo-9781561592630-e-0000009336. Solistes Européens, Luxembourg, Christoph König. Farrenc: Symphonies Nos. 2 and 3. Naxos 8.573706, 1 Apr 2018, CD. Johannes Goritzki, Radio Philharmonie Hannover des NDR. Louise Farrenc Symphonies 1 & 3. CPO 999603-2, 1998, CD.